view the payment status of any particular invoice, cancel an invoice, make a list of buyers and products. 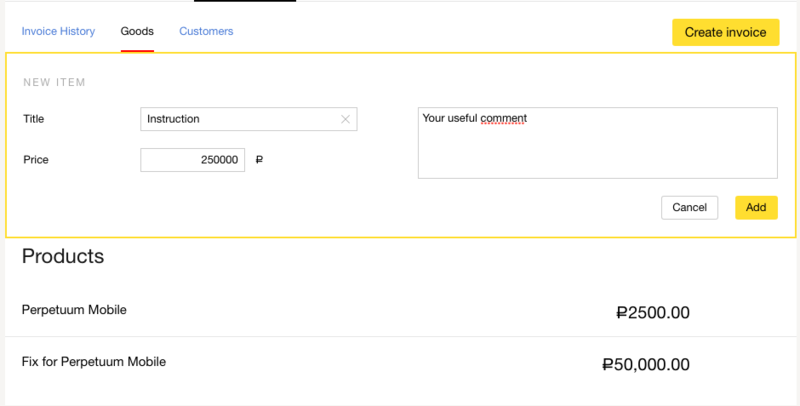 If you don't have the Invoicing section in your Merchant Profile, you can create an additional store specifically for invoices by sending a request to our manager. Log into your Merchant Profile, navigate to Invoices to clients and click Create invoice. 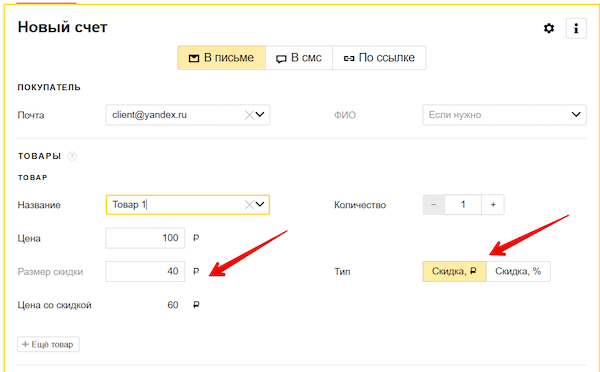 You will see a form for creating an invoice. 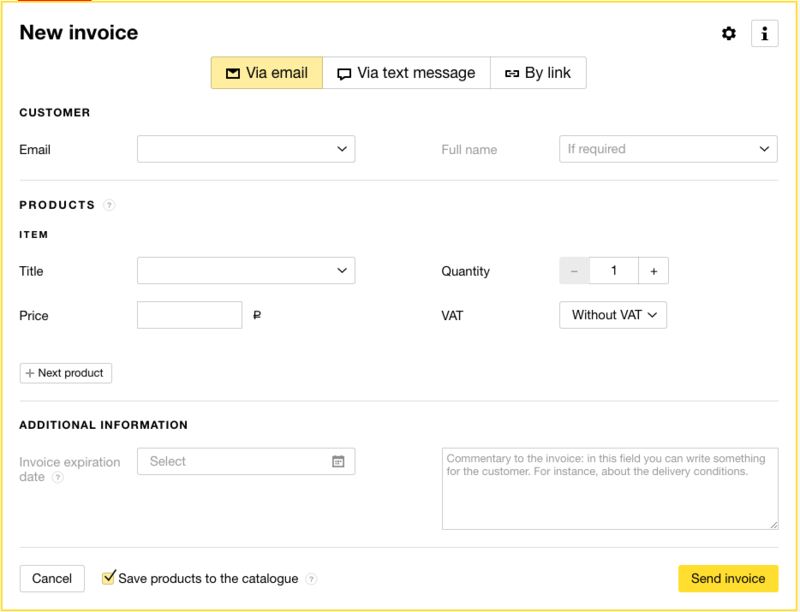 Specify the type of invoice: via email, text message, or a link. phone number — if you're sending the invoice via text message. Specify the names, prices, and the number of products. 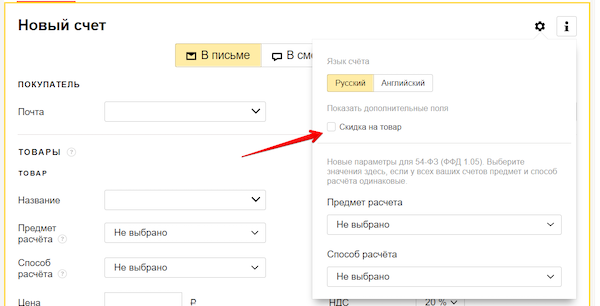 If necessary, you can set the expiration date for the invoice: the payment button will stop working after the set date. You can also add a message for the buyer in the form of a comment. If you created an invoice via email or text message, click Send invoice, and it will be immediately sent to your client. If you created a link, click Create invoice, copy the generated link, and send it to the client via chat. All created invoices are saved in the "History" tab of the Invoicing section. You can view the invoice number and its status, cancel or repeat the invoice. If the client received the invoice via email, they will be able to check the order within the email, click Pay, and pay the invoice using any convenient way. You will receive the payment notification. If the client received the invoice via text message or chat, they will be redirected to the page containing the list of ordered products upon clicking the link in the message. After checking everything and clicking Checkout, they will be able to pay the invoice using any convenient way. You will receive the payment notification. If you're selling something at a discounted price, you can show it in the invoice. The buyer will immediately see how much they'll save. Navigate to the invoice settings by clicking the gear icon on the right. Check the Product discount box. You will see the buttons for selecting the discount format (monetary or percentage) and a field for entering the discount amount. Select the product and specify the price without discount as well as the discount amount. Total price will be calculated automatically. You need to indicate a discount for each product individually. If you'd like to keep the price for some of the products, leave the Discount amount field empty. 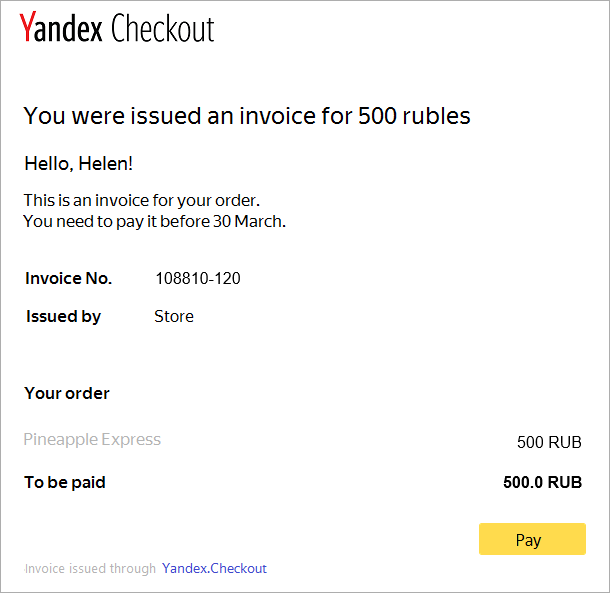 Those who use the Yandex.Checkout solution for 54-FZ and send the receipt data to the online sales register will have to fill out a few additional fields when creating an invoice. The additional information won't be displayed to the buyers as it's included only for creating the receipt to comply with the law. VAT — just specify your rate. Payment subject — category of goods and services that you sell ("payment subject attribute" from the law). You can omit it, but it's a requirement by law since 1 January 2019. Payment method — category of the method you use to accept payments ("payment method attribute" from the law). You can omit it, but it's a requirement by law since 1 January 2019. 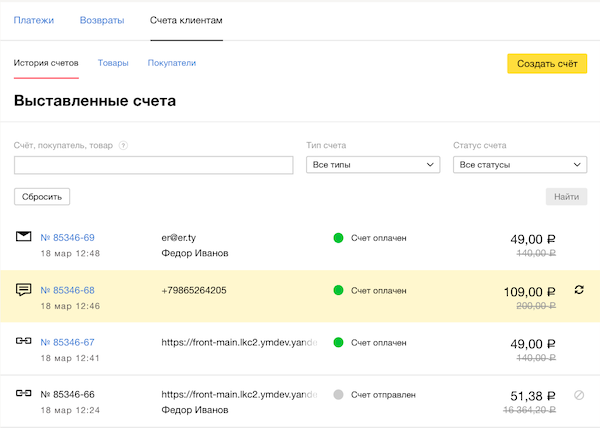 If you always sell the same product range, you can set constant values for Payment subject and Payment method, and they will apply to all invoices. 2. Navigate to the invoice settings by clicking the gear icon on the right. 3. Select the preferable values. They will appear in this invoice as well as all of the following invoices. 4. To hide the fields in the form, Check the Don't show when creating an invoice box (you will see it after filling in the fields). They won't be displayed again. You can change the values or unhide the fields right there in the settings. If you reissue such invoice, all of the values specified in its settings will remain, but you will be able to change them. View the Invoices to clients tab: you will see a list of your issued invoices. Each invoice has the status indicated to the left of the amount. Additionally, all paid invoices appear in the list of payments: enter the invoice number in the Transaction, order, buyer and click Search. If the invoice is paid, this payment will be in the list. Invoice history includes a search field. Enter some information about the invoice: invoice number, part of the phone number or email, customer's name, or the product name. After that, click Search, and the service will show you all the invoices containing these details. If the invoice status is Sent, you can cancel it at any time. View the Invoices to clients tab. Find the required invoice in the list. Click the crossed circle (to the right of the amount). Now, when the customer follows the link, they will see an error message instead of the invoice. If you need to create an invoice that does not differ from the one already issued (or differs very little), you can repeat it. 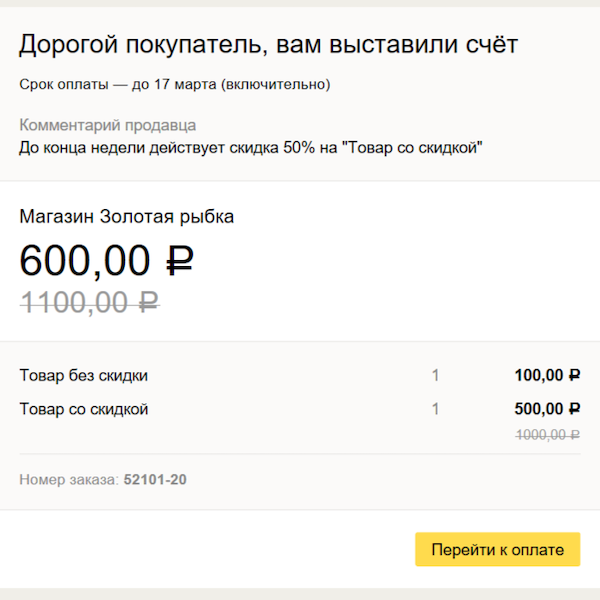 Use the Reissue invoice button: two arrows to the right of the amount. Find the invoice you want to reissue and hover over it. You will see the icon with two arrows. Click it. 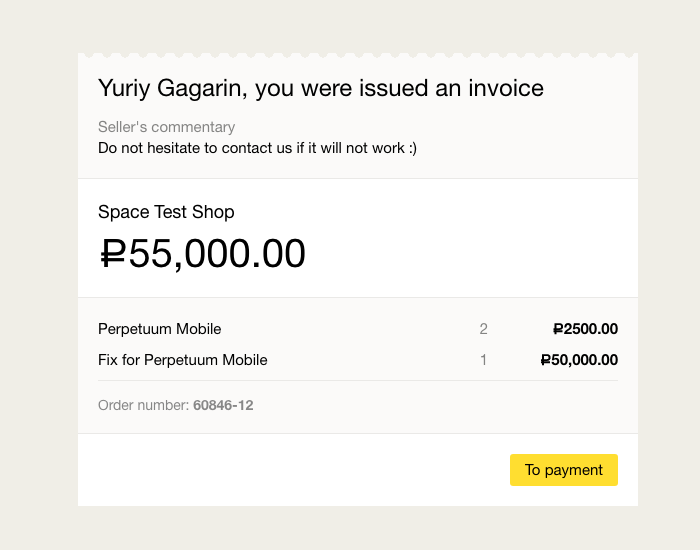 This opens a new invoice creation form, already filled out with all the details. You can edit them if needed. That's it. You can send the invoice in the usual manner. You can keep a list of products in your Merchant Profile: it's convenient for quickly filling out invoice details. Navigate to Invoices section, view Products tab, and click Add product. You will see a form for adding a product. Fill out the name, price, and description (optional) fields, then click Add. You can add products as a list in an XLS or XLSX file (Excel or other table editor). Navigate to Transactions — Invoices to clients, open the Products tab, and click Add a list. You will see the Add items as a list block. Click Select file, select the required file on your HDD, and click Add. The easiest option is to download the ready-made template and add items to it. You can add a maximum of 500 items at a time to a single file (that's 500 lines in an Excel table). Maximum file size is 500 KB. All products in the file must have a name and a price (numerical). The table should not contain extraneous columns and images. After the file is uploaded, your products will appear in the list on the page. If the list already contained any products, the new ones will be added to them. The store may include a maximum of 100,000 products. If necessary, you can remove all the items in the list with a single button. Click Remove all products. Confirm or cancel the deletion in the pop-up window. To download the list of products from your Merchant Profile to an XLSX file, navigate to Transactions — Invoices to clients, open the Products tab, and click Download the list. Important You can save a maximum of 500 items per file. If there are more items in your list, they will be downloaded as several files, for example, if there are 1,500 items in the list, you can download three files of 500 items each. You can keep a list of buyers in your Merchant Profile: it's convenient for quickly filling out invoice details and organizing your client's contact details. Navigate to Invoices section, view Buyers tab, and click Add a buyer. You will see a form for adding a buyer. Fill out the fields (full name, address, phone number) and click Add.